The Jewish Free Press, Calgary, March 6, 2015, p. 12. Adelman, Penina V. “The Golden Calf Jumps Over the New Moon: Mythmaking Among Jewish Women.” Anima 16, no. 1 (1989): 31–39. Bloch, Abraham P. The Biblical and Historical Background of Jewish Customs and Ceremonies. New York: Ktav, 1980. Elwell, Sue Levi. “Reclaiming Jewish Women’s Oral Tradition? An Analysis of Rosh Hodesh.” In Women at Worship: Interpretations of North American Diversity, edited by Marjorie Procter-Smith and Janet Roland Walton, 111–126. Louisville: Westminster / John Knox Press, 1993. Epstein, Isidore. Studies in the Communal Life of the Jews of Spain; as Reflected in the Responsa of Rabbi Solomon Ben Adreth and Rabbi Simon Ben Zemach Duran. 2d ed. New York: Hermon Press, 1968. Feldman, Ron H. “‘On Your New Moons’: the Feminist Transformation of the Jewish New Moon Festival.” Journal of Women and Religion 19 (2002): 26–51. Friedlander, Gerald. 1981. Pirkê De Rabbi Eliezer = (The Chapters of Rabbi Eliezer, the Great): According to the Text of the Manuscript Belonging to Abraham Epstein of Vienna. 4th ed. Judaic Studies Library. New York: Sepher-Hermon Press. Novick, Leah. “The History of Rosh Chodesh and Its Evolution as a Woman’s Holiday.” In Celebrating the Moon: A Rosh Chodesh Anthology, edited by Susan Berrin, 13–22. Lanham MD: Rowman & Littlefield, 2006. Saidel, Rochelle G. “Rosh Hodesh as a Woman’s Holiday.” Jewish Bible Quarterly 32, no. 1 (2004): 58–61. Tabory, Joseph. 1995. Jewish Festivals in the Time of the Mishnah and Talmud. Jerusalem: Magnes Press. Zevin, Shelomoh Yosef. 1999. The Festivals in Halachah: An Analysis of the Development of the Festival Laws = [ha-Moʻadim Ba-Halakah]. Trans. Uri Kaploun and Meir Holder. ArtScroll Judaica Classics. New York: Mesorah Publications. A most intriguing work of rabbinic literature is the volume known as Pirkei deRabbi Eliezer. Although it ostensibly consists of midrashic discourses by Rabbi Eliezer ben Hyrkanos, a prominent sage from the generation following the destruction of the Second Temple, it is clear from its contents—for example, in its references to Muhammad and his wives—that it cannot have been completed before the medieval era. 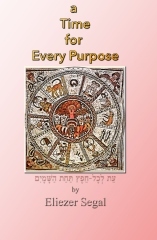 Pirkei deRabbi Eliezer has been of especial interest to students of Jewish ideas and practice because it preserves numerous traditions concerning mystical beliefs and obscure liturgical customs. Now Aaron might easily have issued a simple and generic request for gold and silver. Had that been the case, the Israelites would have donated generously (as Jews may always be counted on to do when approached for a fundraising campaign). By singling out the jewelry of their wives and family members, however, Aaron had reason to hope that the women would be so attached to their adornments that they would put up effective resistance to the fashioning of the idol. And in the end, concludes our author, this was precisely how it turned out. The ladies refused to relinquish their beloved ornaments and tried to convince their spouses of the folly of investing their wealth in an ineffectual image. Although their refusal was not sufficient to completely thwart the building of the golden calf—since the men had no compunctions about contributing their own earrings—the midrash observes that the women of Israel did merit divine rewards for their efforts, both in this world and in the next. In the next world, it was promised that they may look forward to being restored to their pristine youthfulness, as described by the Psalmist: “He satisfies you with good, so that your youth is renewed.” As for this world, it was ordained that ladies should observe New Moons [ Rosh Ḥodesh] in a more intensive manner than the males. The notion that females observe New Moons more rigorously than males is one that finds expression in some earlier sources. The Jerusalem Talmud enumerated several occasions on which women were known to refrain from work; some of these occasions were acknowledged as legitimate customs to be upheld, whereas others were dismissed as inauthentic and baseless. Not working on Rosh Ḥodesh is on the “approved” list. There are passages in the Bible that indicate that Rosh Ḥodesh was observed as a full-scale festival. Indeed, it is unmistakable that many Jews were treating the New Moon as a day of rest throughout the Second Temple era, as we find in Apocryphal works like 1 Maccabees or the Book of Jubilees. Yet several talmudic sources seem to state explicitly that there was no prohibition of labour. A tradition that is cited in the Babylonian Talmud posits a correlation between the number of individuals who are called to the reading of the Torah and the concern that the resulting prolongation of the service might eat into people’s work schedules. It follows from this premise that on days when people do not normally work there is time for lengthier Torah readings with more readers. In this connection, the Talmud designates the New Moon as one of the days when people would not be missing out on work. Rashi cited the tradition about women resting on Rosh Ḥodesh in the name of “my venerable teacher”; and a gloss inserted in his commentary supplied the proof-text from Pirkei deRabbi Eliezer. The Tosafot commentary objected to the way that the Talmud seemed to be treating Rosh Ḥodesh as a work-less day, when a tradition quoted elsewhere in the Talmud stated the opposite—that it should be classified as a day on which work is permitted. They resolved the apparent inconsistency by asserting that it all depends on whether you are approaching the matter from a male or a female perspective. In his important treatise on Jewish liturgical customs Sefer HaManhig, the twelfth-century Provençal scholar Rabbi Abraham ben Nathan ha-Yarḥi insisted that Rosh Ḥodesh should be defined as a workday, and that the contrary custom observed by women does not alter that fundamental premise. The story about the golden calf in Pirkei deRabbi Eliezer did not really provide an explanation of why the ladies’ reward should be associated with the New Moon. The Sefer HaManhig and other commentators found an answer to this question in an indirect implication of that story. Based on this juxtaposition, several medieval authorities (some of them claiming to cite a dubious “midrash”) pointed out that the official inauguration of the Tabernacle took place on the Rosh Ḥodesh of Nissan. Hence it was deemed appropriate that the virtuous ladies should be rewarded in a manner that was linked to that date—and by extension, to all the New Moons of the year. Rabbi Simeon ben Ẓemaḥ Duran cited an interpretation he had heard from his brother Judah to the effect that the beginnings of the twelve months had originally been apportioned among each of the twelve tribes of Israel; but when the men of those tribes sinned with the golden calf, those dates were reassigned to their blameless wives. Rabbi Simeon observed that the women were selective in determining which tasks to perform and which to avoid on the New Moon. Thus, they refrained from spinning but allowed themselves to sew and do similar crafts. He linked this detail to the story of the Tabernacle, where the Torah singled out spinning as an activity in which the women excelled. Though all the sources that have been cited thus far agree that refraining from labour on the New Moon is an exclusively feminine prerogative, there were some authorities who tried to allow the guys some share in the privilege. Rabbi Isaac of Dampierre, one of the leading figures in the Tosafist school, ruled that when it comes to strenuous agricultural labours like ploughing and sowing, even men should not be performing those activities on Rosh Ḥodesh. He derived this ruling from the biblical precedent of Jonathan son of King Saul who contrasted Rosh Ḥodesh with a “day of activity,” which was translated in the ancient Aramaic Targum by a term that normally carries the connotation of a working day.